Stay Informed about HRIHumanistic Robotics Inc. | 2/3 | Humanistic Robotics Inc.
Over the years, advances in controls have greatly improved intuitiveness and thus simplified the operation of construction equipment in many cases. Beyond that, ever-improving GPS technology and machines like Komatsu’s intelligent Machine Control dozers and upcoming excavator, point to a not-so-distant future where a lot of operators could be doing so from outside of their machine entirely. The SafetySense® Controller provides the ability to wirelessly control machinery in a safe way, without burdening the operator with another heavy tool to carry. The controller was originally developed for military robotics, where both safety and mobility are extremely important just as they are in the construction industry. Humanistic Robotics, Inc., (HRI) a robotics and technology innovator dedicated to making the world safer through engineering and design, is excited to share their SafetySense® Controller with the industry at ConExpo-Con/Agg (Platinum Lot, Booth 9594). After a soft launch in 2013, the SafetySense® Controller now has widespread availability, and with a sales force throughout the U.S. and Canada, HRI is looking to change the way equipment manufacturers view wireless control. To read the full press release please click on the following link. Humanistic Robotics, Inc (HRI) will be attending in the upcoming RoboBusiness Conference on October 23-25, 2013 in Santa Clara, CA. 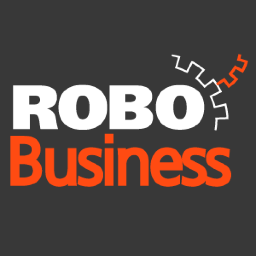 RoboBusiness is the leading business development event for the global robotics industry, where executives come together to accelerate the commercial advancement of robotics. To setup a meeting with a representative from HRI at RoboBusiness, contact us at info@humanisticrobotics.com. Humanistic Robotics, Inc., (HRI) is a robotics and technology innovator dedicated to making the world safer through engineering and design. Humanistic Robotics, Inc (HRI) will be participating in the upcoming Robot Industry Association’s (RIA) 25th Annual National Robot Safety Conference on October 14-16, 2013 in Indianapolis, Indiana. RIA’s 25th annual National Robot Safety Conference is the world’s leading event for industrial robot safety and compliance. In-depth coverage of the new R15.06 (2012 Edition) of the Robot Safety Standard which is harmonized with the ISO 10218 standards will be provided. HRI will also display its Safe Remote Control System (SRCS). 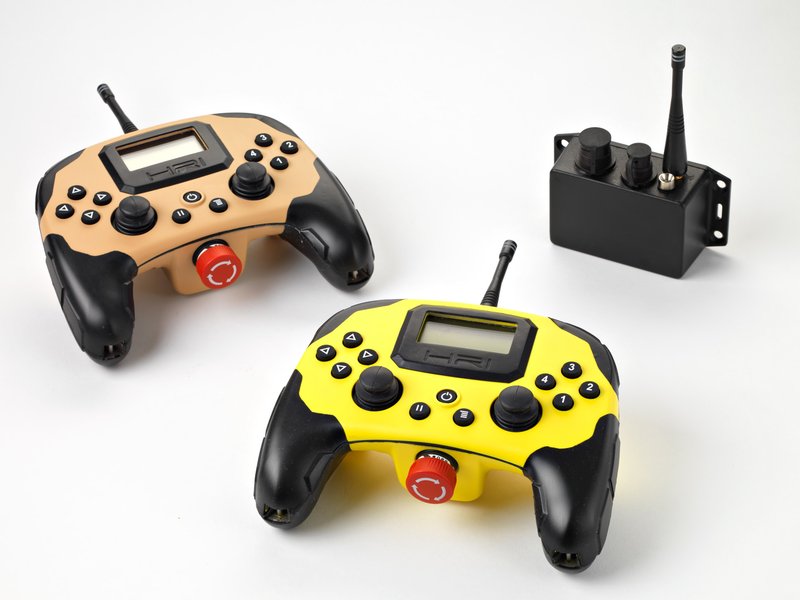 The SRCS is a wireless handheld controller that achieves much more capability than a traditional “belly box” controller or military control console, in a lightweight and ergonomic package that the user can comfortably interact with during an entire day. In form, the handheld device looks like the controllers employed in typical video game systems, but houses much more. It’s a rugged device, water, shock and dust resistant, containing a myriad of safety devices that are far more advanced than most control interfaces – even those that are much larger. It’s a form factor very familiar to younger users, requiring nearly no training, and quickly learned by more experienced operators. HRI is pleased to announce that Rear Admiral (Ret.) Nicholas T. Kalathas has joined our Board of Advisors. Rear Admiral (Ret.) Kalathas most recently reported to Defense Procurement and Acquisition Policy in April 2012 after completing a one-year deployment as commander, U.S. Central Command (CENTCOM)-Joint Theater Support Contracting Command (C-JTSCC), Doha, Qatar. Read the rest of his biography. Humanistic Robotics, Inc (HRI) will exhibit at the 2013 DSEI Conference at the ExCel London Exhibition and Convention Centre on Sept. 10-13, 2013. DSEI is the world’s largest fully integrated defense and security exhibition specializing in Land, Air, Sea, Security and Unmanned Solutions. Based in ExCeL, London every two years, the event brings together international exhibitors from more than 50 countries. HRI will be exhibiting in the North Hall at booth N10-136. HRI will feature the world’s safest, most customizable, and cost effective land mine & IED rollers for route proving, vehicle protection, proofing, and survey. HRI’s roller solutions provide increased safety through consistent ground coverage and terrain mapping while a modular design minimizes down time for simple repairs and routine maintenance. HRI’s featured roller, the Advanced Route Clearance Roller (RCR-A), is built on years of extensive testing and experience in the explosive hazard industry. The RCR-A uses the common swing arm design seen in many HRI products that has been thoroughly tested during explosive tests, endurance testing, and successful fielding. It was designed as a route clearance and route verification roller to be used in combat engineering, force protection, and road clearance missions. The independently-rotating roller banks improve handling for vehicles that require higher-speed capability. HRI is pleased to announce that Lieutenant General (Ret.) Michael D. Barbero has joined our Board of Advisors. Lieutenant General (Ret.) 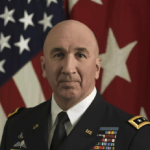 Barbero was most recently the Director of the Joint Improvised Explosive Device Defeat Organization (JIEDDO). In this role he was responsible for leading the Defense Department’s actions to rapidly provide counter-IED capabilities in support of combatant commanders, military services and other federal agencies to enable the defeat of the IED as a weapon of strategic influence. Read the rest of his biography. UN takes delivery of 25 new rollers. The use of mechanical demining equipment has greatly benefited humanitarian-demining operations worldwide. One machine type, the mine roller, has several key advantages when compared to other mechanical demining equipment. Because rollers are simple to operate, easy to maintain and have few consumable parts, they have low initial costs and operating expenses. 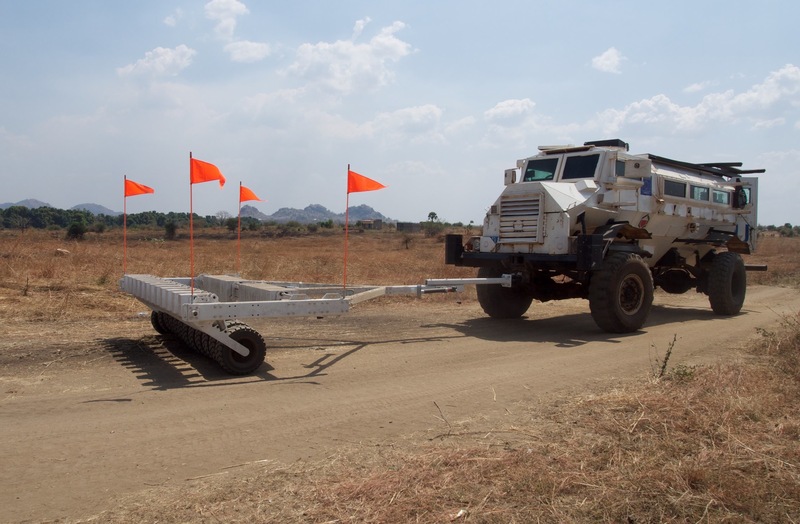 Despite their advantages in humanitarian-demining operations, rollers are not as widely used as other mechanical equipment, such as flails and tillers. Because roller testing is, to date, either ad hoc or limited mostly to surface-buried mines, the capabilities and limitations of rollers are not widely known. This has led to a generally held belief in the humanitarian community that roller performance is suboptimal; consequently, roller development, testing and use has remained stagnant and limited. There are millions of landmines in the ground around the world and someone in Bucks County is going to do something about it. Bristol-based start-up Humanistic Robotics recently received $2 million in Department of Defense grants to make their minesweeper prototype a commercially viable product, according to the Inquirer. One of the leaders is a 20-something entrepreneur and has something to say about it. See what after the jump. Humanistic Robotics was launched in 2005 by then University of Pennsylvania Wharton business school student Samuel Reeves and Joshua Koplin, then a master’s student at the Pratt Institute School of Design in New York. The third version of their SCAMP (Specialized Compact Automated Mechanical-clearance Platform) was on display recently at Grundy Industrial Complex in Bristol, Bucks County. The device is made of a heavy steel frame that uses six pneumatic pistons to press two rows of nine steel wheels to the ground. At best, Reeves says SCAMP can cost $100,000 and can clear mines from an acre in a day. The duo, which has planted their 5,300 square foot headquarters on Canal Street in Bristol, estimates some 110 million anti-personnel land mines are planted in 60 countries. Few more than 150,000 are cleared per year and most removal methods are inefficient, they told the Bucks County Courier Times. The DOD grant is helping their transition into a new headquarters in Bristol and helping with additional research. They also hope to expand from four employees to 12. The funding was mostly secured by Congressman Patrick Murphy, who first won our hearts one year ago when the Eagles fan cast the only dissenting voteagainst a resolution congratulating the New York football Giants for their Super Bowl victory. Murphy’s district covers lower Bucks and some of Northeast Philadelphia. We’ve been working on this for a year and a half. First, we wrote a business plan and that took months and months. As we were doing it, we talked to people in the field, specifically a think tank in Geneva. Their job is to know everything about mine clearance and come up with new ideas about mine clearance, know the trade-offs and methodologies – basically know everything about how it’s done. I was talking to them about rollers – rollers are our cornerstone technology for detonating mines because they create a lot of ground pressure – and their initial reaction was very negative. They said things like “nobody uses them” and “they don’t work.” I kept asking why, because from a practical standpoint they seem so simple and cheap to produce. They realized they didn’t really know for certain the answers that they were giving me about rollers. They decided that since it’s their job to know, they should do a study about whether rollers are a viable clearance technology, where are they used, and where are they successful. It was something they needed to know. So they hired us to do the study for them since we were asking about them. They sent us all over the world. We went to Geneva a couple of times to meet with the think tank, and they sent us to Afghanistan, Thailand, Cambodia, Bosnia, Croatia, and Canada. Staying simple helped win Reeves and his business partner, Josh Koplin, the $5,000 grand prize in the first annual Weiss Tech House PennVention competition. 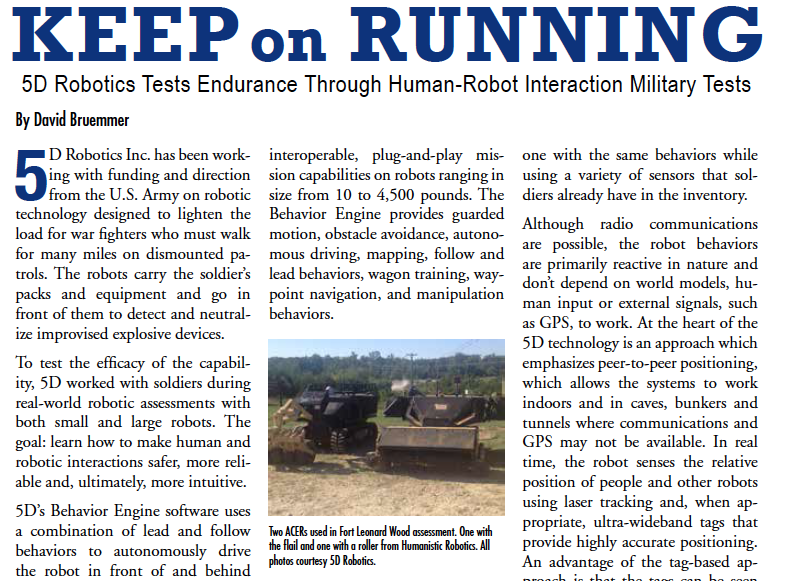 Their entry, HRI Minesweeper, is a lower-cost landmine-clearing machine. While mechanical de-miners can carry price tags of a quarter-million dollars, Reeves’ and Koplin’s invention will cost less than $100,000. “I’m going to shoot for $50,000,” he says, explaining that each dollar saved can be applied to getting the job done faster and safer. PennVention drew 56 entries, including an improved hip implant and an unusual beach towel in second and third places—as well as an aroma chip that releases scents to attract consumers to products “at-point-of-purchase,” an alternative wallet for athletes, and a portable thunderstorm detector. The purpose of the competition is to encourage budding inventors with mentoring and money—and to showcase the offerings of Weiss Tech House, an undergraduate-innovation hub that was created three years ago [“Gazetteer,” March/April 2004]. “Many people have a bunch of ideas and just no outlet for it, “ says Anne Stamer, director of the tech house. Participants came largely from the engineering school and Wharton, but also from the College, and the nursing, mouthguard dental schools, and law schools. In the first phase, teams were assigned mentors after turning in brief descriptions of their ideas. Next they submitted slide presentations, which were ranked by judges from different segments of industry who gave additional feedback. The 11 finalists won $250 cash awards to produce their projects and received additional mentoring from a product-design firm. PennVention culminated in an invention fair on April 8 and seven-minute presentations before a panel of five judges. Jonathan Danoff EAS’06, and his partner Jared Bernheim EAS’07 won second place for Intellistem, a prosthetic hip implant that has the potential to last up to 30 years—much longer than other products on the market. A major cause of hip-implant failure is that the bone breaks down around the site due to a lack of weight-bearing force being transferred to it, he explains. Surgery to replace an implant is painful and much more expensive than the original procedure. In addition to the second-place prize of $2,500, Danoff’s team won the Leonardo DaVinci Prize of $5,000, free legal counseling, and an offer to license their technology. He hopes to get funds for animal testing next year. Wharton graduate and admitted sun-worshiper Allison Floam W’05 won third place and $1,000 for Sunsak, a beach towel “with an array of features to make your stay in the sun more comfortable and safe.” For one thing it’s round, allowing the sunbather to simply rotate his or her body as the sun’s position changes throughout the day. It also turns into a tote bag. She also won a $2,500 Consumer Product Award from QVC and the opportunity to meet with QVC buyers for advice on getting the product to the market. He wrote a business plan, and they contacted a Geneva-based think tank, which in turn sent them around the world—to Eastern Europe, Cambodia, Thailand, and Afghanistan—to research landmine clearance. 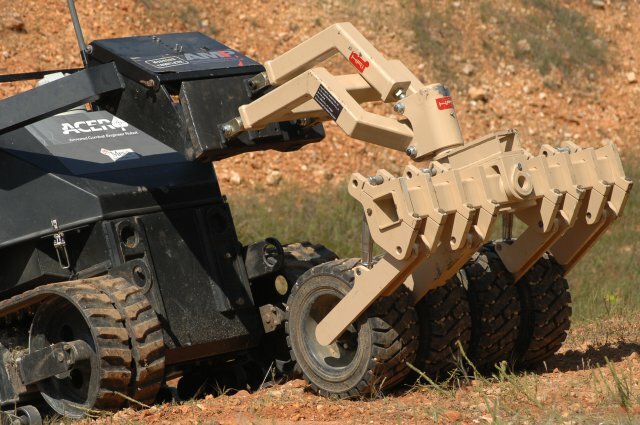 The pair eventually came up with a design (www.humanisticrobotics.com) that combines a magnet (to remove ground metal); a remote-control-operated roller (to detonate any mines); and a rake to turn over the soil, making it easier for a manual de-miner to come through and complete the operation. In addition to encouragement and money, Weiss Tech House has provided another benefit to Reeves: space to store their 1,000-pound steel-roller prototype. “One slight downside to being in the landmine-clearance industry is that the business trips are not necessarily in the safest locations,” Reeves admits. Though excited about his success, his parents “were not wild about the idea of our going to places like Afghanistan. But it gives us a certain amount of authenticity. When we’re talking with people who’ve been in the military for years and have cleared mines, we can say, ‘We were in Afghanistan, too.’” —S.F.